In the last week I've been working with a lot of blue, which is somewhat alarming as I am NOT a blue person at all, at all. 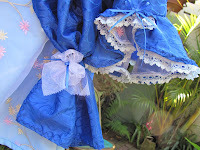 I'm working on putting together a knitting pattern for a pretty lace & beads neck warmer, a button-up collar thing and because the lace stitches I've used are called "little waves" & "fish tales" it conjures up images of mermaids. I wonder if mermaids get cold necks? Anyway - this knitting pattern will fit a young girl 6 to 12 yrs and I'm doing an adult version in 10 - 12ply yarn ... handspun. SO first I must spin the yarn and the first step is to dye some roving in suitably mermaid-ish colours. 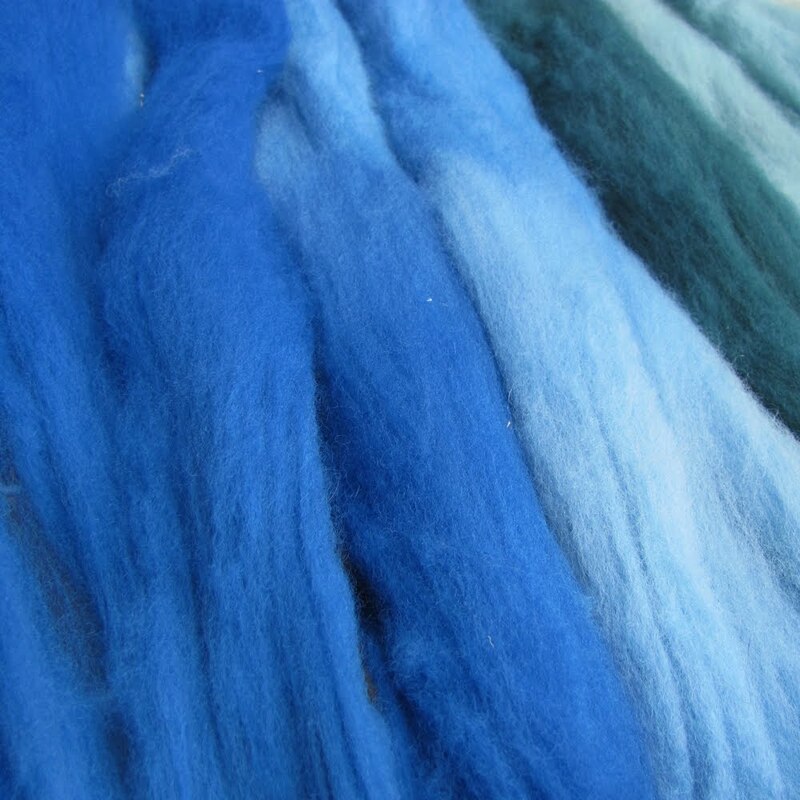 Like this - Bendigo Woollen Mills' "ReadySpin" dyed with Sandolan primary blue. 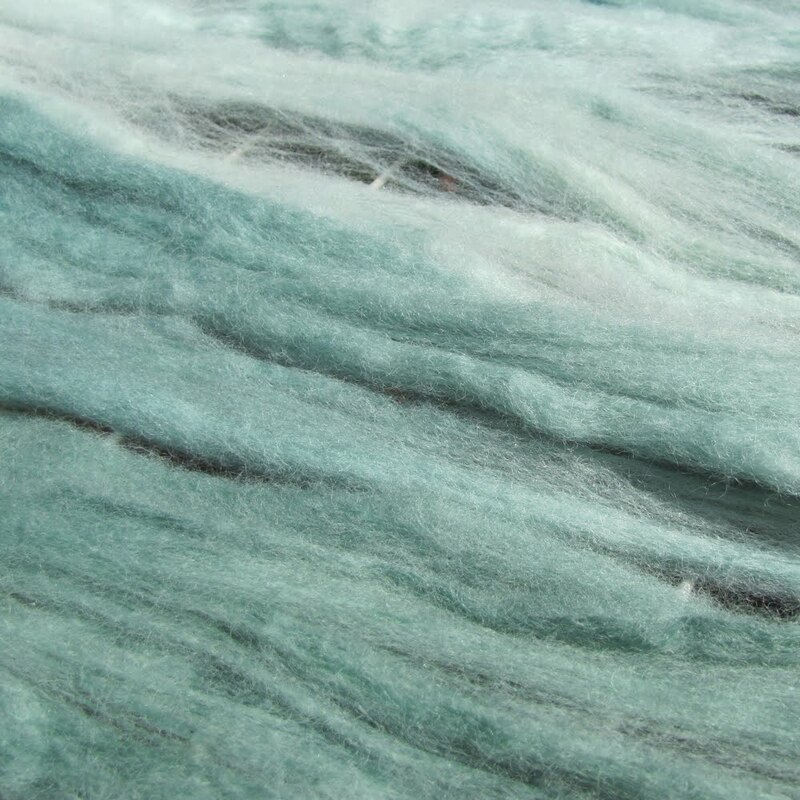 The green/blue in the back corner had 1 teaspoon of Landscapes "Kelp" added. As there was still some colour left in the pot and I don't like to waste all those chemicals, I put in another 200g of roving which come out a soft sage green - very gum-leaf. 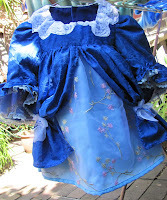 The other very blue project is a very Over The Top dress-up outfit for little granddaughter. 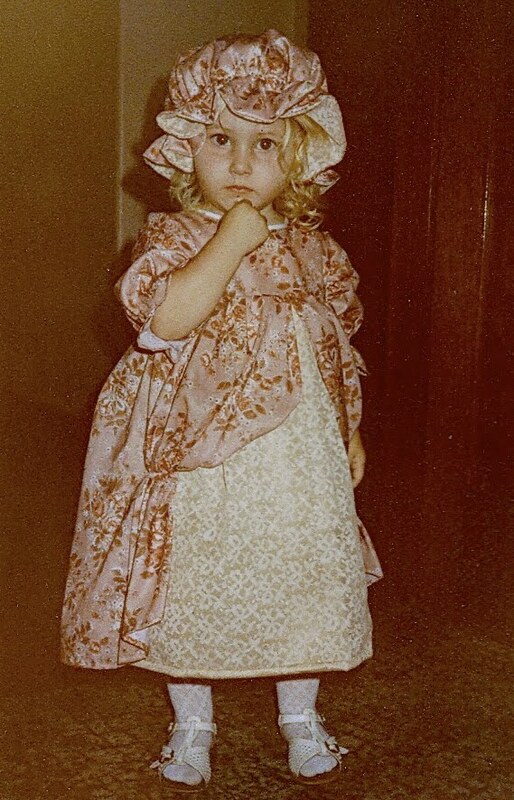 Now when my daughter was about the same age her daughter is now, I made her a dress-up outfit inspired by an illustration in a book of Nursery Rhymes ... here she is - what a little moppet! Difficult to get a decent photo without a little body in it. Apart from the visible machine stitches this one is slightly more "historically accurate" - square neck-line (trimmed with elaborate lace) and very 18thC sleeves, elbow length, pleats at the top of the sleeve head & "engageants" (aka those circular frills). 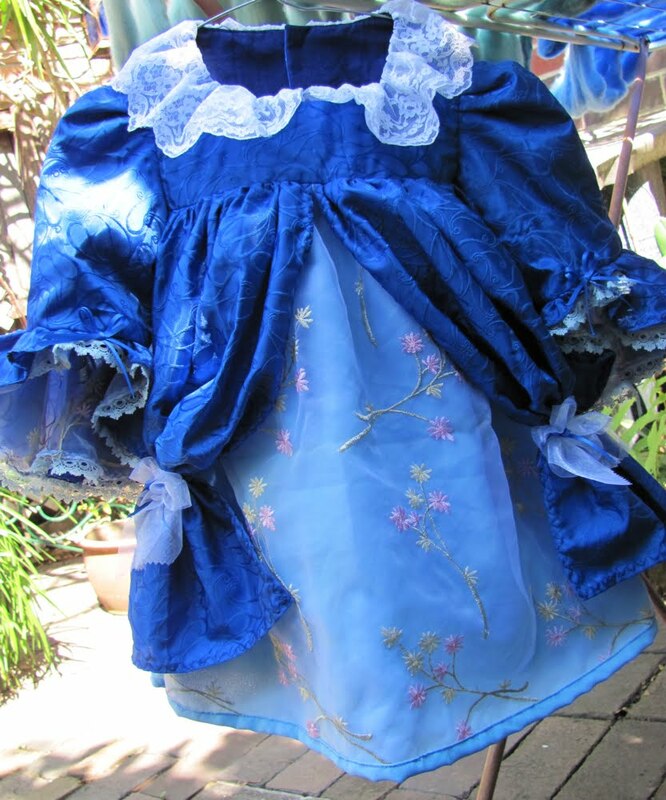 Had a lot of fun sewing this outfit - using lots of stuff out of stash - that electric blue embossed poly fabric has been hanging about since the 1980's! 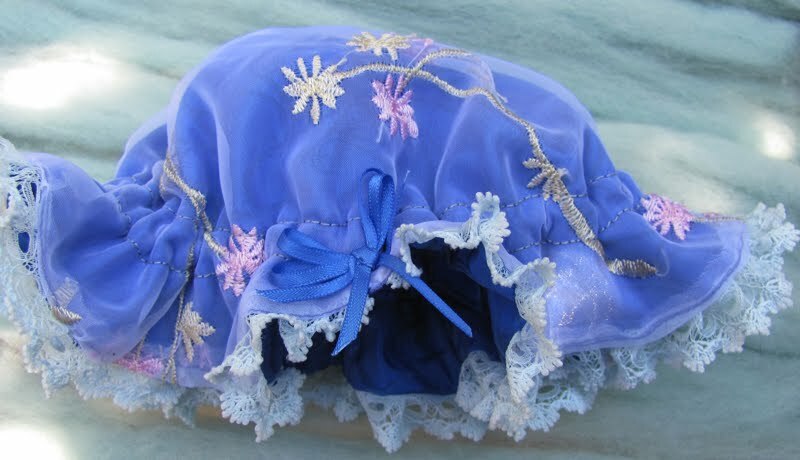 I hope little one gets some fun from wearing it and being a Princess!